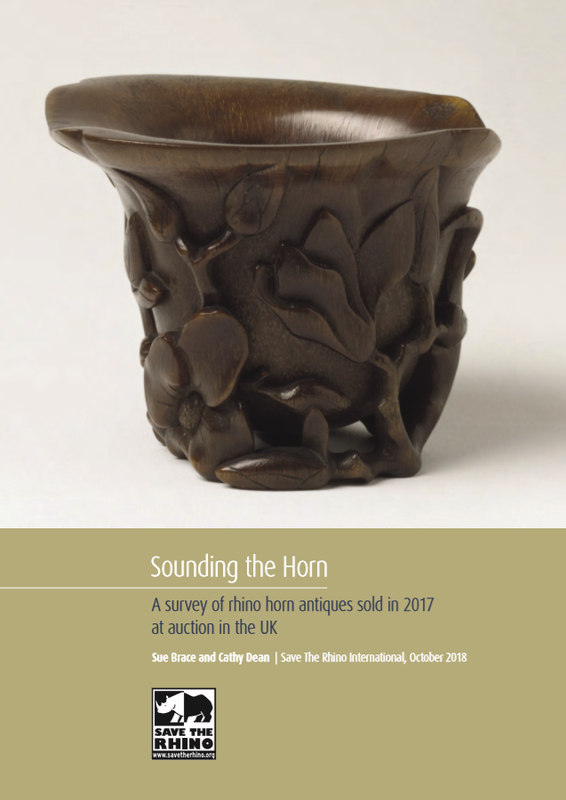 Save the Rhino International’s report, “Sounding the Horn” suggests that the United Kingdom (UK) antiques industry is trading rhino horn lots without proof of provenance in many cases. In a system open to obvious abuse/fraud, how can anyone know with any degree of certainty that ‘modern’ rhino horn is not being laundered through the UK due to such lax rules/oversight – illicit rhino horn being exported on either via a ‘legal’ mask, or illegally trafficked, thus stimulating demand/poaching? “Our research found that 89% of rhino horn antique items for sale in the UK last year had no proof of age or origin. This makes it possible for modern, illegal rhino horn to be laundered through the UK. The lot descriptions for 58 of those items included the weight. No weights were given for items made of other materials such as wood. Sophisticated criminal networks use a wide variety of methods to traffic illegal rhino horn to consumer countries, often routing it through EU countries.